What’s the Difference Between Concrete Wall Sawing and Wire Sawing? When you need to have concrete reshaped into a usable form, you will need to cut it. Here’s a better look at the difference between concrete wall sawing and wire sawing. When you need to have concrete reshaped into a usable form, you will need to cut it. 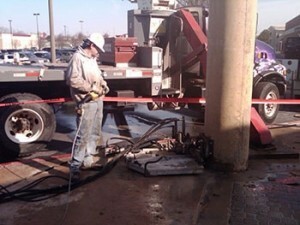 However, hardened concrete can be difficult to work with even when you are cutting or drilling it. That’s what multiple forms of concrete sawing have developed. Here’s a better look at the difference between concrete wall sawing and wire sawing. The basic difference between the two methods of concrete sawing is what you need them for. Think about a solid concrete wall. When a building first goes up, that’s all the wall is – a slab of concrete. Concrete wall sawing, however, helps transform it into something more accessible and functional. Through the use of concrete wall sawing, cutouts for doors and windows can be created. Depending on where you would like the commercial HVAC unit to go, the concrete wall sawing can make a hole in the ceiling or the side of the building. Creating a staircase that connects one floor of the building with the next floor up or down also calls for concrete wall sawing. There’s little doubt that wall sawing is incredibly useful. However, as useful as wall sawing is, when you need to cut concrete, then wire sawing is the safer option. No matter how deep the concrete is, the wire saw can cut through it. The other walls around the slab or block of concrete that you are cutting will remain stable, meaning it is much easier for your workers to focus on cutting without worrying about concrete collapsing on them. You must also strive to protect your workers’ hearing while they work on cutting through concrete. Wire sawing is much quieter than wall sawing is, which means that it won’t present as much of a danger to your employees and their sense of hearing. That said, you should still provide them with as much hearing protection as possible because any job site where concrete cutting or drilling is happening is still likely to be noisy enough to warrant the use of personal protective equipment. This entry was posted on Friday, July 13th, 2018	at 12:00 pm	. Both comments and pings are currently closed.